While I’ve been back in town since Friday, this has been my first opportunity to post. Dad appears to be on the mend, and hopes to get out of the hospital by Tuesday. It turns out that he had a gangrenous gallbladder, which is a phrase I absolutely adore saying. Try it yourself: gangrenous gallbladder, gangrenous gallbladder, gangrenous gallbladder. It’s fun! So, he had the gallbladder removed, but not the appendix, as his doctor said that at his age (73), if he hadn’t yet had problems with it, he probably wouldn’t. For some reason, I was amused when the doctor told me that in the twenty or so years he’d been performing surgery, that this was the most gangrenous gallbladder he’d seen. Leave it to my dad. Now, before you get up in arms about my lack of sympathy, by that time I’d already ascertained that no other organs were affected and that they didn’t anticipate long-term consequences. When I left on Friday afternoon, he seemed perfectly okay, but as I later discovered, he had to go in for one more procedure after the fact: they had to go in endoscopically to insert a stent and allow his bile to drain properly. The doctor had warned me about this possibility, but everyone kept saying that his drainage was fine. As of this writing, everything seems okay, and I’m greatly relieved. So, I’m sure you’re asking at this point, what about Star Wars? After all, that is the natural progression after discussing a gangrenous gallbladder. Furthermore, after spending Thursday at the hospital, I went to see it agin that evening, this time at the River Oaks in Calumet City, Illinois. The River Oaks is a colossal barn of a movie theater in which I first saw all of the original Star Wars films, as well as pretty much every other movie of consequence. It was the place to go for event flicks, as it had a ginormous screen which could accomodate 70mm films. Back in the day, you could sit in the front row and have to literally turn your head to see the sides of the screen. These days, it’s rather run down. The curtains no longer open and close and the sound is muddy. But it’s still huge, and retains an incredible amount of personal nostalgia. So, I had to go while I had the chance. As for the movie itself? Wow. I was dumbstruck, but for the first time during the prequel years, in a good way. I honestly didn’t think George Lucas still had such a film in him. I wish that this Lucas could go back and redo Episodes I and II. I’m not certain whether it was because this one was for the future of the franchise, or because he’d just been marking time until now, but he seemed a much more confident director this time out, even if he still has a spot of bother with small things like actors and dialogue. Since pretty much everything from this point onward is a spoiler, allow me to say that I was thoroughly satisfied by the picture, and am still trying to decide whether it fits in before or after The Empire Strikes Back. Lucas wasn’t kidding when he said that this one would be dark. While it was certain that things would end quite badly for just about everyone, the manner and magnitude of the deaths was still shocking. The sequence that affected me most–more than Padme’s death or the youngling massacre–was the “Order 66″ montage. Even though most of the Jedi Knights had been little more than background figures in the prequels, it was sad to see such a diverse, interesting cast gunned down like punks. At least Mace Windu got in his licks before being cast into the depths. I sat through the last third of the film stunned by the intensity of the images, including the literal hellfire of the lava planet Mustafar. I particularly liked the visual metaphor of Anakin gazing up at a solar eclipse: light being snuffed out by darkness. While the volcano duel has been part of Star Wars lore since 1977, it didn’t quite turn out as I’d always imagined. No, Anakin didn’t plunge into a lava pit; perhaps Lucas realized that even the Chosen One shouldn’t survive that. The actuality was almost worse: Obi-Wan follows the theme of amputation to its logical extreme and leaves Anakin a limbless torso (thankfully, I didn’t think of Monty Python’s Black Knight at the time), allowing him to burst into flame while pitifully attempting to escape the fiery river. Nasty stuff, but very well done. Following that was a nightmarish hospital scene, the evil inversion of the bacta tank sequence in The Empire Stikes Back. (It even featured the evil twins of the medical droids that healed Luke Skywalker.) The point-of-view shot of Vader’s visor being lowered onto Anakin’s face felt like a premature burial. Brrrr. The moment we’d been waiting for all these years finally arrived, the first, booming words of James Earl Jones as Darth Vader. How appropriate that they turned out to be so un-Vaderish. Leaving aside the scary stuff for a moment, I greatly enjoyed the first 20 minutes of the movie: it was exciting, fun, silly and everything I could want from a Star Wars film. There was actual banter as well as moments of honest humor. For the first time, I found Anakin likable and sympathetic. (Especially by film’s end, once everyone including Padme has attempted to manipulate him.) He had matured (somewhat), biding his time and preaching patience. It was nice to see he and Obi-Wan working together as a team. A couple of moments in Episode III cause one to reexamine the rest of the series, and one centers around Artoo. It had long been assumed that the reason the droids didn’t appear to recognize Obi-Wan in Episode IV is that their memories had been wiped. Sure enough, that was Threepio’s fate, but little did we suspect that Artoo retained his knowledge. And why not? No one but Threepio understands him anyway, and he’s always been good about playing his cards close to the barrel. We now know that little Artoo knew all along about Luke and Leia’s parentage. He even knew that he and Threepio shared a “previous life” together! The other such moment regards the infamous midichlorians, the tiny organisms said (in Episode I) to exist within all living cells and to provide a conduit to the Force. It had been suggested that Anakin’s apparent virgin birth may have been caused by the midichlorians to satisfy the prophecy of a Chosen One. In Episode III, Chancellor Palpatine (aka the evil Sith Lord Darth Sidious) recounts to Anakin the story of Darth Plagueis, and says that he could influence the midichlorians to create life. While the scene has been left deliberately vague, there are obvious implications. First, it’s reasonable to assume that Plagueis was Palpatine’s mentor. While Palpatine may have been lying about knowing how to create life as part of his temptation of Anakin, the fact that he brought the midichlorians into it is intriguing. Was Anakin even aware of the theories surrounding his conception, and was Sidious playing to that? Or is he truly suggesting that either he or Plagueis was directly responsible for his existence? If so, did they do so to take advantage of the prophecy of the Chosen One? Or is that prophecy of the self-fulfilling variety?Unfortunately, there will presumably never be in-movie answers to these, but at least the scene does suggest a purpose to the introduction of the midichlorians. Again, Ian McDiarmid stole the show as Palpatine/Sidious. Finally revealed in all of his cackling, mad glory, he cemented his position as one of the all-time screen villains. Not faring so well was Natalie Portman as poor, stupid Padme. Not only was most of her role confined to pining in her apartment, she was left to continually remind us about Anakin’s goodness, despite mountains of evidence to the contrary. I guess that it would be a bit much to have a woman who appears twelve months pregnant swinging from ropes and such, but she was really screwed (so to speak) in this film. Much of her role hit the cutting room floor. There was an entire subplot in which she organized some of the senators into the beginnings of the Rebellion. That’s why we have an action figure of young Mon Mothma, who in the finished film appears only in an extreme long shot. I don’t think that the movie loses much, if anything, from the loss of these scenes. It’s surprising just how many of the Hasbro toy tie-ins for Episode III involve characters and creatures that were almost completely cut from the film: not just the missing senators, but a giant bug that was to have been ridden by Yoda. (The dragonfly can be seen in the far distance of one of the Wookiee planet scenes.) There were no jetpack troopers, and the proto-Scout Walkers that have featured heavily in Episode III merchandising only appeared in one shot. Two toys that made welcome appearances in the film were General Grievous’ wheelbike and Boga the lizard. I really liked Boga, and was sorry to see it seemingly killed. (Though in my reality, Boga swims away to squawk another day.) The wheelbike was a nifty design, and I loved the ratcheting noise it made as it sped along. For once, the CGI backgrounds and creatures were seamlessly woven into the live action footage (or is that vice-versa? ), and even the beast/rider combinations which seemed so fake in previous episodes worked here. General Grievous was a solid secondary villain, with his four-sword attack echoing Kali from The Golden Voyage of Sinbad. Thematically, he served as a proto-Vader, an earlier model of cyborg with an even worse breathing problem. 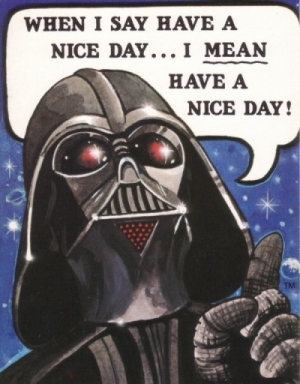 One thing that I felt the film lacked was an explanation of the significance of the name Vader. Since the rest of the Dark Lords had surnames with negative connotations (Maul, Tyranus, Sidious and Plagueis), Vader seemed instead to have been chosen from the Big Book of Sith Names. I was waiting for Palpatine to casually mention his great grandpappy, Joe Vader. Yet, one can also read the fall of Anakin and the Jedi as a renunciation of this notion. The Council couldn’t truly support Anakin because his natural-occurring feelings for family were literally outside their experience. By being so inflexible, they offered no help with his spiritual crisis, leading him to seek out Lord Sidious. Ultimately, Luke Skywalker rejected the counsel of Yoda and Obi-Wan regarding his father. They insisted that Vader must be killed, but Luke felt a hint of goodness in their familial bond. And in the end, he was right. Moreover, Vader’s redemption, while seemingly a selfless act of sacrifice, indeed came out of this self-same inability to let go of his attachment to Luke: he ended the Sith order and restored balance to the Force to save his son. I’ve long wondered about this Force-balancing business. In Episode I, there were thousands of Jedi and only two Sith. Seemed unbalanced to me. By the end of Episode III, there were only two of each. While it doesn’t seem as if this is the interpretation Lucas is going after, I still wonder if bringing balance to the Force meant doing away not only with the Sith, but the antiquated ways of the Jedi. At the conclusion of Episode VI, Luke appeared ready to revive the Jedi under his own terms. Whew. There’s a lot to think about, which is one hallmark of a good movie. And that was Revenge of the Sith: at long last, a good Star Wars movie.